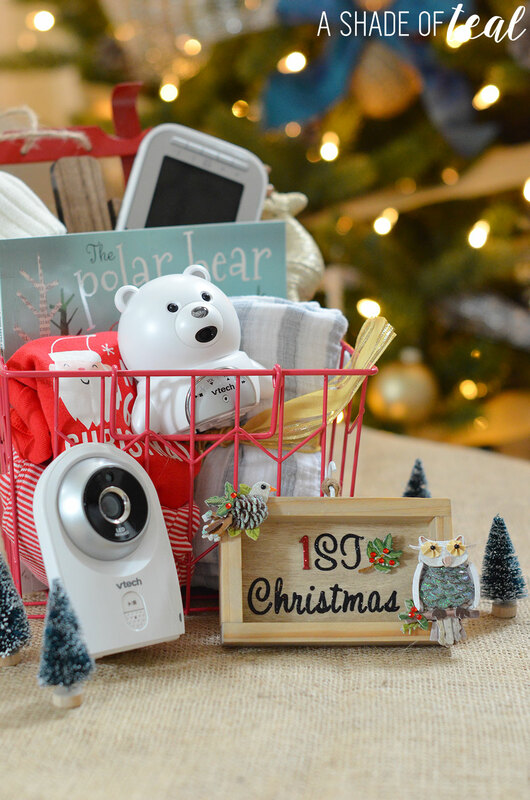 It’s the season for giving and what a better gift to give than a 1st Christmas gift basket to a new mom! If you have kids then you know and understand how expensive they are, especially when your a 1st time mom. I was amazed by all the little things you need for a baby. But when it came time for my daughter’s 1st Christmas I was so excited to get her all the first Christmas items. I wanted to create that memorable experience where she will have keepsakes for the rest of her life, even though she wouldn’t remember it! This year I’m celebrating my new daughter’s 1st Christmas. I also have a friend who is celebrating her child’s 1st Christmas so I thought this would be a perfect idea for a holiday gift. 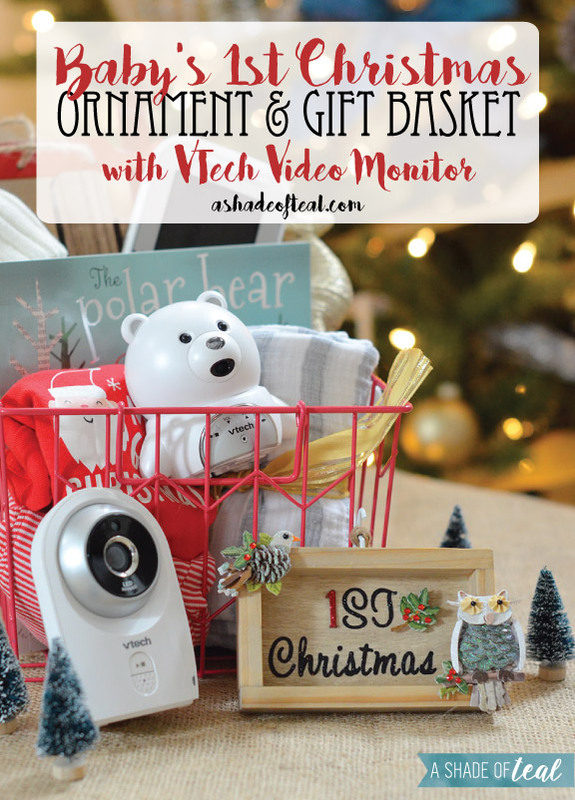 I decided to create a 1st Christmas gift basket with one of my new favorite items, the VTech VM341-216 Bear 2 Camera Full Color Video Monitor. I found the VTech Bear Video Monitor online at Babies R Us (it’s also available in-store). I’m a total sucker for technology that makes life easier with my kids. The VTech Bear Video Monitor comes with 2, yes 2 video cameras! It has a teddy bear-shaped camera and an additional standard camera that feature automatic night vision and full-color video. You can then watch your little one on the large 4.3-inch color LCD screen. I currently have both cameras in my nursery. The standard camera is located across the room on a shelf. Here I have a full view of the crib. The teddy bear camera is located next to the crib, so I have a closer view. Both camera’s have a two-way talk-back intercom, in addition to the built-in lullabies and sounds. You can also add 2 more cameras to pair with the monitor display, keeping eyes on all your kids! 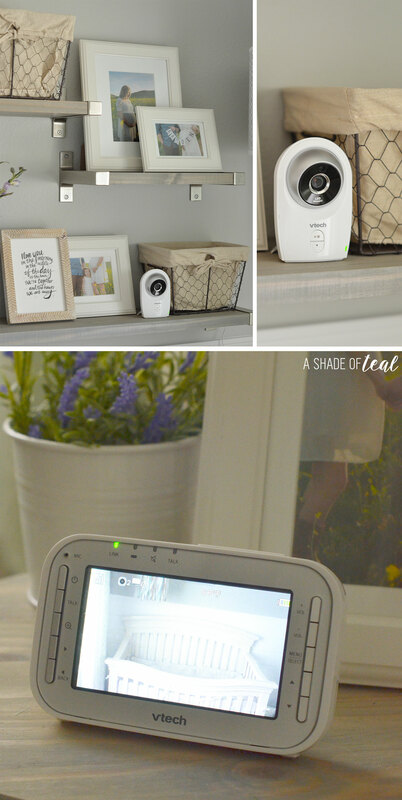 This in on my wishlist, so I can have another camera in my oldest daughters room along with our playroom. Step 1- Stain or paint the box. Then screw the hook to the top and tie a string to the loop. Step 2- Add your stickers. I added 1st Christmas to the front & DEC 2016 to the back. Step 3- Add the holiday stickers. Step 4- Hang & enjoy! After I made the custom ornament I made the rest of the Baby’s 1st Christmas Gift Basket. I added a mini Stocking, Christmas Jammies, toys, a blanket, and a Christmas book. Plus, the VTech Bear Video Monitor is included as well! I really hope this Baby’s 1st Christmas Ornament & Gift Basket will be something she cherishes for years to come. 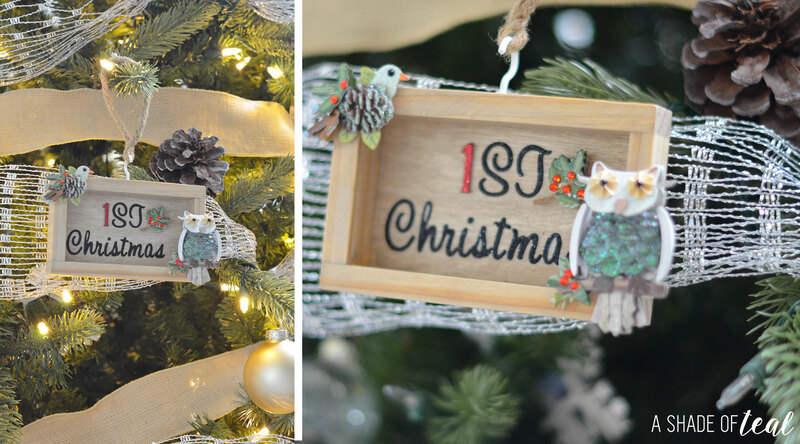 Having keepsakes to celebrate a baby’s Christmas first is so special, I wish someone made me one for my daughter! So if you looking for gift ideas for a new or experienced mom then I highly suggest making them a holiday gift basket. 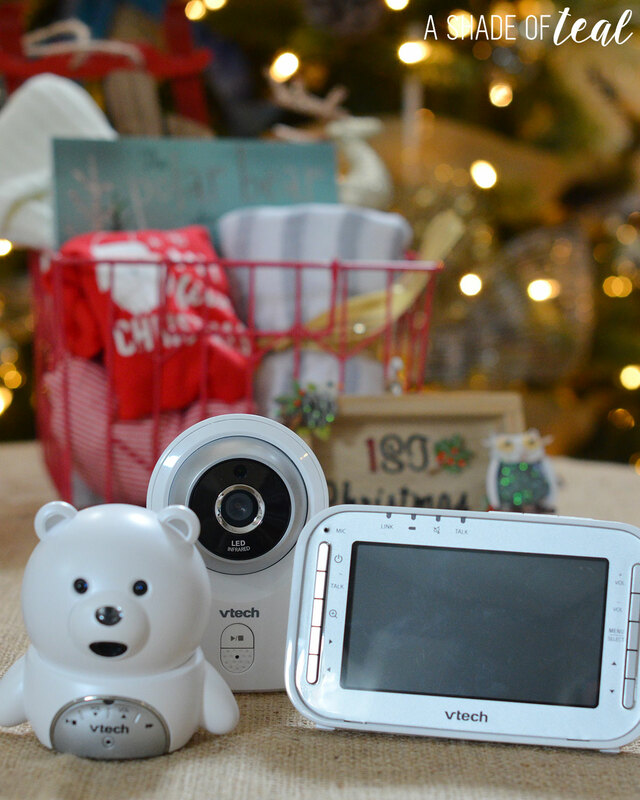 The VTech Bear Video Monitor is also the perfect gift for any parent. I just know my friend will love it as much as I do! For more ideas on staying connected at home follow VTech’s Pinterest page or their Facebook page. This is such an amazing gift for a new mummy at Xmas. Love the Vtech Bear video monitor handy to have! 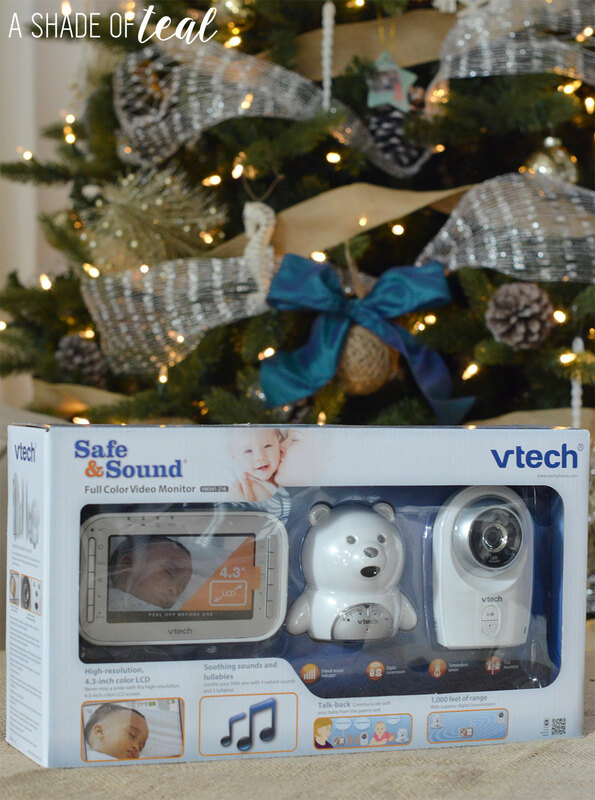 Our childrens’ safety and security should be treated seriously and this VTech Bear Video Monitor is a must have for all mommies nowadays especially the working moms, so they can fully monitor their children’s welfare any time of the day. I love VTech so much! Their monitors are amazing! What a beautiful monitor and a beautiful gift basket! I love the 1st Christmas placard! I love your ornament gift basket! I wish I knew that video camera when my son was a baby. This is really awesome! This gift basket looks awesome! That camera does too. They weren’t that fancy when my kids were tiny. Oh my gosh, isn’t that the cutest gift basket?? Love the ornament you made and that monitor is the perfect addition to this gift. I’m an electronics junkie so this is right up my alley. I want every item you mention. That’s a very nice gift basket. I wish I would have done this when my girls were that age. That monitor looks very nice too. We are celebrating my son’s first Christmas and I have been looking forever for a good ornament for him. I love this gift basket and ornament. These looks like a cute basket! My children is older now but I’ll share this with my friends with younger babies. Just pinned! The ornament is so beautiful, and what a cute little gift basket! I wish I had that video monitor when my kids were younger!